The area surrounding the Trail among the Trees offers also further family attractions and interesting trip and hiking opportunities. If you do not like hiking, have fun in the resort of Bachledka. You can enjoy sports, games, free time and fun activities that meet the needs of all age groups. 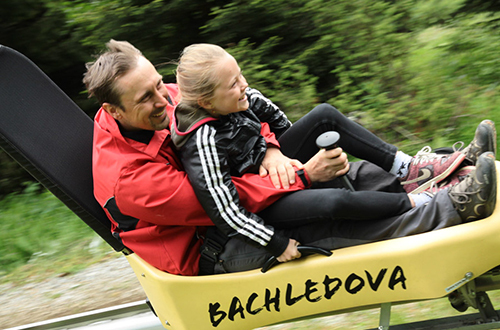 In Bachledova you can have a ride on the longest bobsleigh track in the Tatras. It is 1200 m long and has 15 curves offering a breath taking experience. The track super elevation is 111 metres and maximum speed you can reach is 40 km per hour. Its transport capacity is 200 persons per hour. The boarding point for the bobsleigh track is near the upper cable car station. The ride is safe and the speed is controlled by visitors themselves. The bobsleigh track is open whole summer and closes only for rain. You can have fun and also learn something new on your trip to Bachledka. 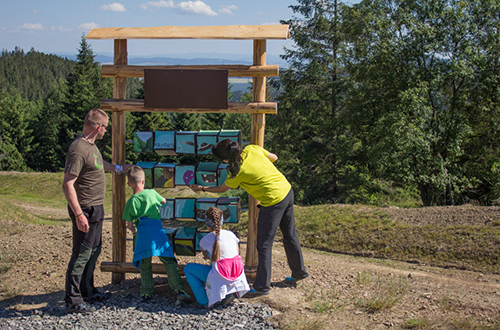 Kid’s educational trail goes along the ridge of Spišská Magura where Kubik the teddy bear teaches the kids about animals, birds and plants of this territory and makes it fun. The trail consists of two parts. 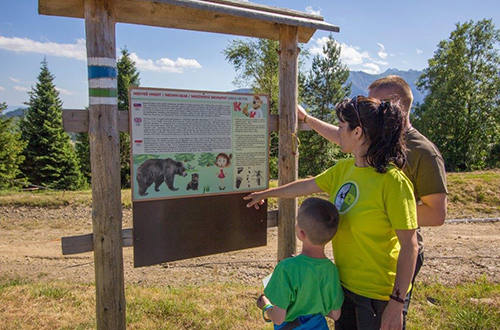 Visitors can learn a few facts about the animals living in this territory. They can learn about the animals living in this territory on the small circuit. It has 8 stops, it is 300 meters long and goes from the playground to the observation tower. The kids can solve tasks at these stops and to note down the results in a game plan that can be obtained at the tourist information centre. When filled in correctly, the kids will receive a sweet treat. The grand circuit goes from the observation tower to the Jezerske lake. It is 6.5 km long and it informs the tourists of bears living in the local forests. Nesting boxes are situated round the stops and they offer an opportunity to watch birds as closely as possible. The tourists can check their strength, nimbleness and agility at the exercise stops and obstacles positioned along the trail on the way to the lake. A new nine hole golf course offers a new and easy fun activity for the whole family. 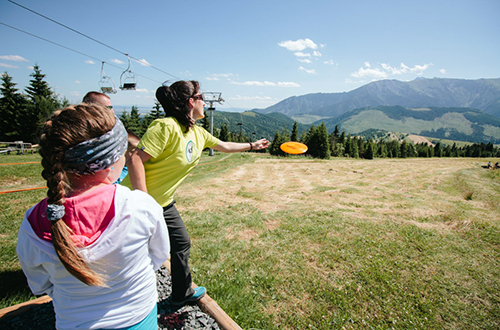 Get to the top of the hill by taking a cable car ride, walk down the Bachledka ski slope and play disc golf. You can borrow a disc golf set in the tourist information centre and then you can start to play. Due to construction work on the new cable car is the disc golf closed. 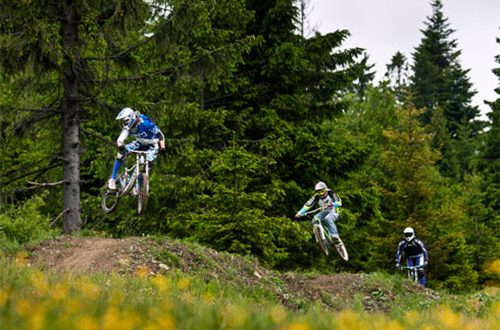 Bachledka Bike Park offers 5 downhill routes of various level of difficulty. Simple routes Family and Natural routes are for amateurs bikers and DH routes Root, American dream and Roller coaster routes are for more experienced bikers. It is the perfect sport and adrenaline experience. The resort neighbourhood offers more than 130 km of mountain cycling routes suitable for beginners and occasional bikers as well as for cross-country and all mountain bikers. Due to construction work on the new cable car is the bike park closed. 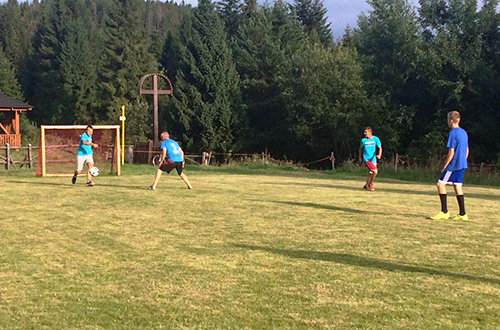 The highest situated soccer field in Slovakia can be found in Bachledka. Playing soccer with your friends at this altitude is simply perfect. You can borrow the ball at the buffet (Buffet pod sedačkou) or in the bike rental shop. Due to construction work on the new cable car is the soccer field closed. In Bachledka there is a big playground for all lively and playful kids where they can play with their friends all year round. There is a tunnel, swings, slides, climbing frames and also a castle. 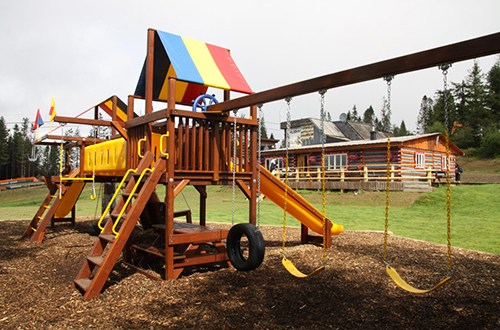 The playground is situated in front of the buffet close to the upper cable car station. The kids who jump do not cross anyone our manufacturer of trampolines says. 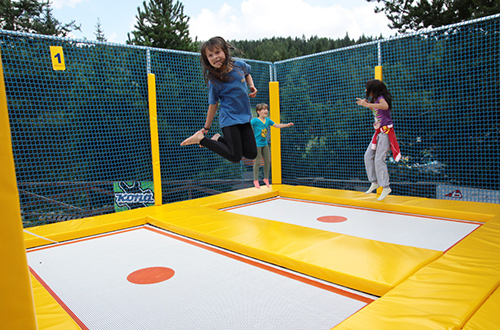 There are two professional trampolines in the kid’s area where both the kids and adults with too much energy can have a lot of fun. 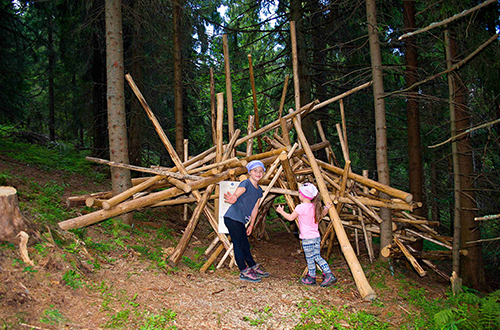 There are interesting forest games waiting for kids at the Macko Kubík kid’s trail. Young tourists have to find out what the forest animals eat, which leaves belong to which trees, which fruits belong to which plants and which prints belong to which animals. 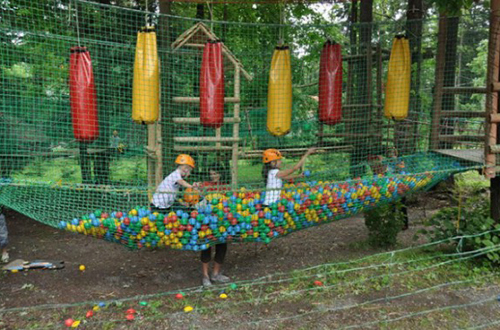 The forest games in Bachledka are both educational and fun games and make teaching the kids about forest life fun..
A small kid’s mini ZOO is situated right above the Bachledka Strachan Hotel close to the boarding cable car station. You can see and also feed little rabbits, goats, sheep and calves there. Bring home an original souvenir from your holiday – a photo taken at our photo point. 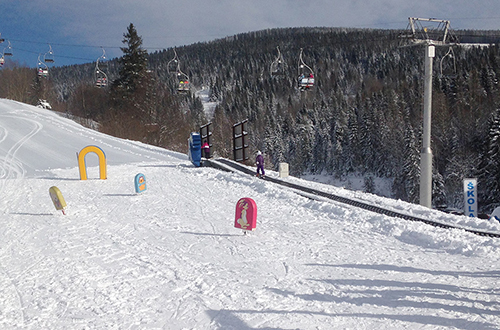 The photo point is located on the Bachledka ski slope in the vicinity of cable car TS3 exit point. Looking for Gorgy’s elixir of life. The forest man Gorgy, the mascot of Bachledka has been living in the forests of Belianske Tatras and Spišská Magura for hundreds of years. He has eagle eyes and perfect health. His secret lies in the regular use of special elixir of life the potion he makes himself. How and what are the ingredients? You have to find out. The elixir of life is protected by the forest inhabitants and the indications to solve this riddle can be obtained only from them. Set out to an adventure trip through the magic forest, get to know its inhabitants and unravel the secret of elixir of life. Due to construction work on the new cable is the access to the game limited. 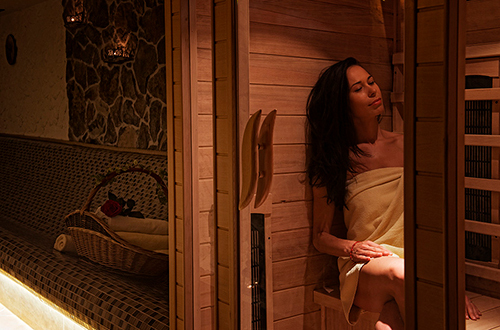 After spending all day outdoors you can enjoy the regeneration massage, whirlpool bath or benefit from sauna bathing. You have a perfect opportunity to clear your mind and regenerate your body. There is a terrific atmosphere in the beautiful and quiet surroundings of Spišská Magura and it is a relaxing oasis for both the mind and the body. Wellness and space centre is situated right below the ski slope in Bachledka Strachan Hotel**** in the Bachledova Valley and in SKI Jezersko Guest House*** situated on the other side of the resort. 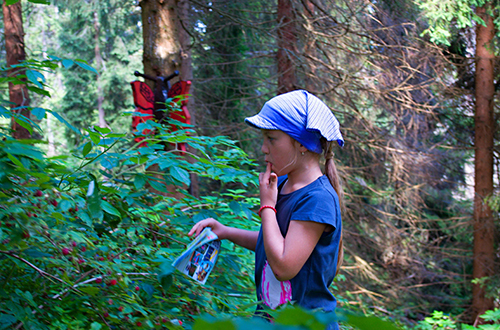 There is nothing better than blueberries, raspberries and strawberries from the forest. During summer your will find a lot of them in the forests of Bachledka. They taste much better picked right from the bushes than organic fruit from the shops. 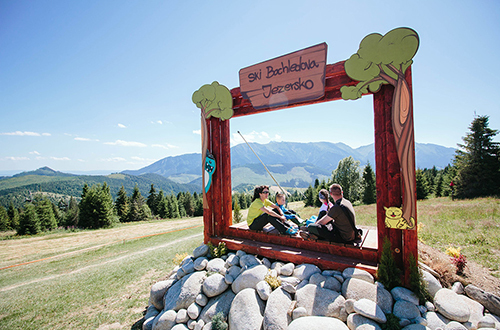 The children’s fun world SUN kid waits for those who are new to skiing at the lower station in the Bachledova Valley. 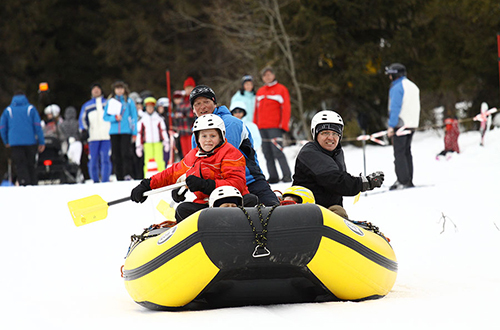 Besides the fairy tale characters located on the ski slope facing southwards the little skiers will also find here skiing conveyor belt, children’s ski lift and ski carousel. There is a ski school Ternawski nearby and its instructors will teach to ski also those most terrified of skiing. 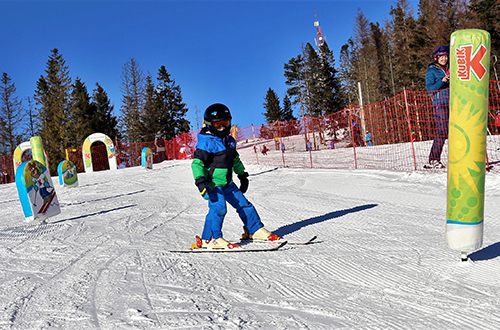 All little skiers who no longer need an instructor can have fun in the children’s fairy tale land of Macko Kubik. It is a secure enclosed area with the kid’s ski lift, number of obstacles, gates and various funny characters. Let your children enjoy themselves and have fun in the kid’s world where ordinary skiing becomes a fairy adventure. The area is situated on the Hrebeň ski slope. If you believed that rafting is only summer sport you were mistaken. In Bachledka there is also rafting on the snow! For those who are daring it will get their adrenaline on the move. It can be found on Hrebeň ski slope and it is 800 meters long. You will go down the slope along a specially groomed track and you will be taken back up the hill on a snowmobile. You can ride there the whole winter if weather conditions allow. Two cross-country skiing trails go along the ridge of Magura from Bachledova toward Ždiar and Prislop and its total length is 20 km. 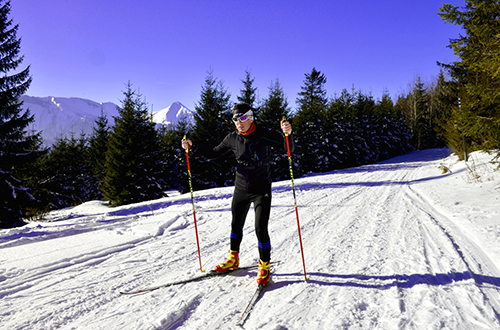 The trail toward Ždiar is set by a snow groomer and therefore it is suitable for all styles of cross-country skiing. There is a loop suitable for a classic style leading to Prislop. 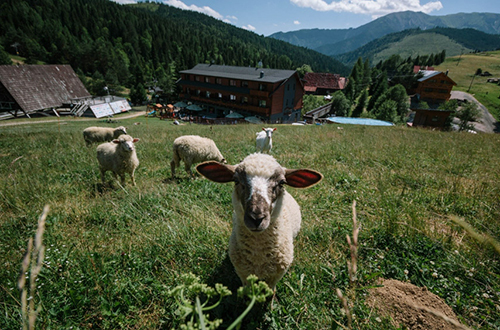 You can go up to the ridge by taking a cable car ride from Jezersko or the Bachledova Valley. 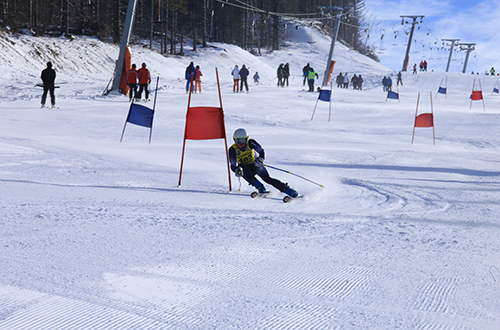 Try out a new slalom track and have a friendly competition with your friends. 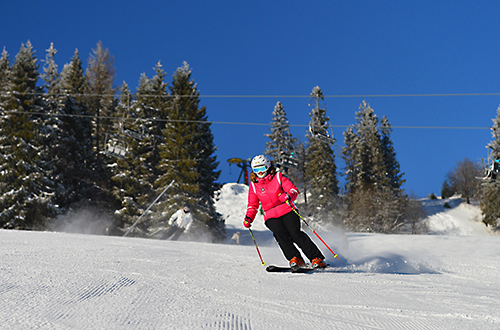 The slalom track is freely accessible whole winter on Bachledka II ski-slope. Fun does not stop with closing the ski lifts! You can go to a party and have fun till late night every Saturday in Apres ski bar La Gamba. You don’t need a driver to get back to the hotel, there is a free party bus to do that. You can enjoy yourself, have fun with friends and do not need to worry about getting safely back to your hotel rooms. 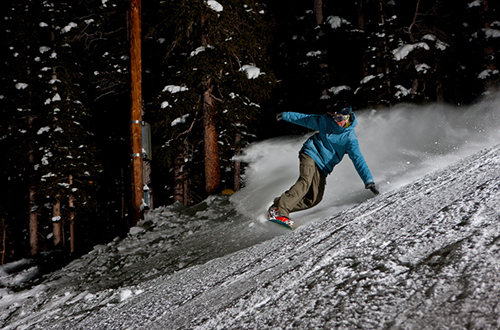 Would you like to go skiing at night in our majestic mountains? 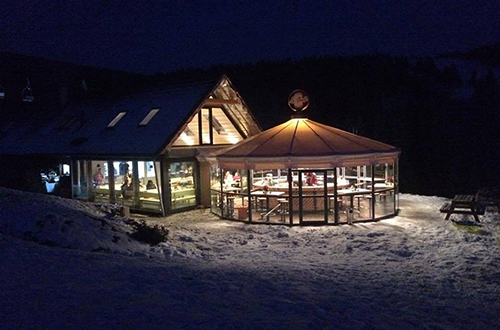 The skiers can also go night skiing on the ski slope of Bachledka II close to the hotel daily from 4pm till 9 pm. You can buy an individual ski pass just for the night skiing or you can go night skiing for free with your daily or multi-day ski pass. In the Tatranska basin there is a unique Belianska cave the largest and the only alpine stalactite and stalagmite cave open to the public in the Tatra National Park. 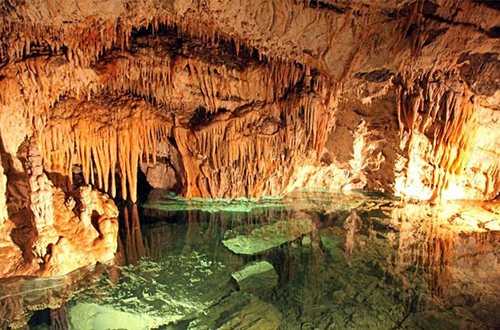 The loop cave trail is 1370 m long and the super elevation is 125 metres. The village of Ždiar is the jewel of Slovakia mainly thanks to its traditions, customs and folklore. 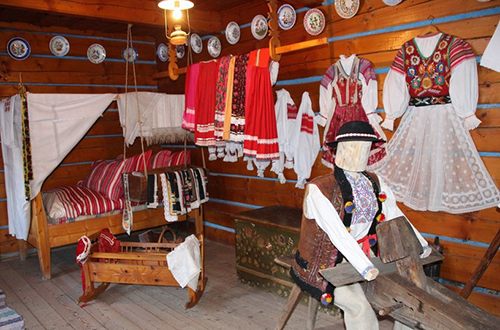 The local museum offers information about the life, living conditions and customs of Ždiar inhabitants. You will have an opportunity to see Ždiar wedding, wear a traditional folk costume and enjoy an interesting guide commentary. You can enjoy the ride on a horse-drawn carriage, local cuisine and the sound of Goral music. Spider park is situated in the Tatranska basin near the car park below the Belianska cave. You can choose from the three routes of different level of difficulty. Have fun and adventure with your family and excel yourselves. 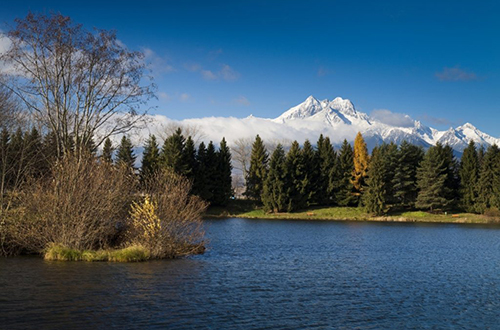 Monk Valley situated in the Belianske Tatras National Nature Reservation is open to the public only in summer and it is one of two valleys open to the public in the Belianske Tatras. 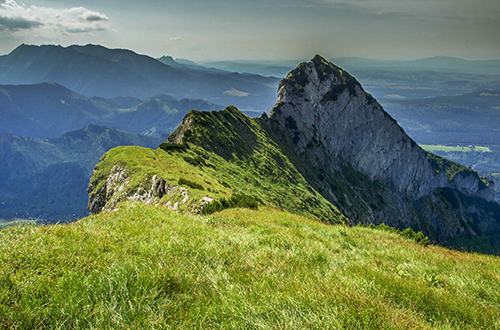 It lies between the peak of Ždiarska vidla (2141m) and the peak Hlúpy vrch (2060m). The departure point for its visit is the town of Ždiar. Play golf, a popular and recreational game and have fun with your family. 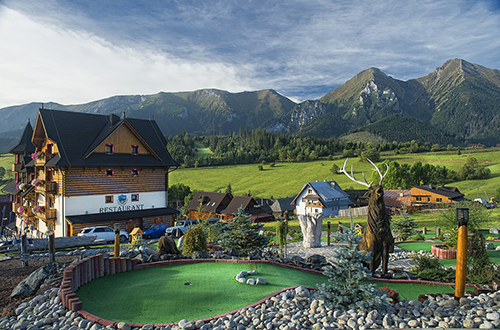 You can play golf in Ždiar on a nine hole golf course where the kids will also get to know and learn about the animals living in this region. 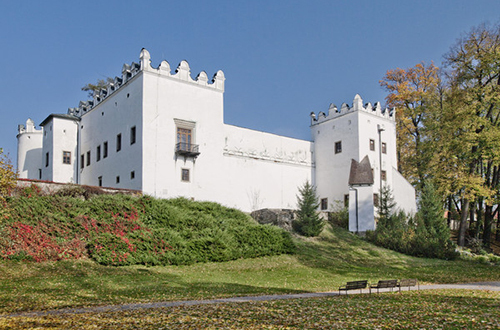 It is situated in Spišská Belá and it is one of the oldest manor houses in Slovakia. It is a jewel of renaissance architecture. The magic and relaxing atmosphere of the manor house is accentuated by the 19the century English landscape park. Besides the precious historical library there are also the pictures of Ladislav Mednyánszky. Today many cultural events and „Manor house plays“ take place in the manor house. The pond situated 1 km before the village of Spišská Belá is a nice relaxing place not only for fishermen but also for tourists. You can buy one day fishing ticket to fish carps and to have a snack and refreshment in the fishing house. 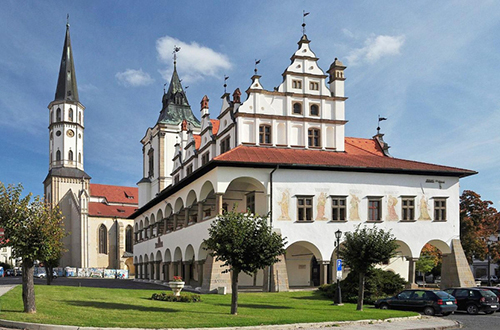 Monastery formerly used by a monastic order of Carthusian monks and later by Camaldolese monks is today a museum featuring the history and monastery life of above orders and preserving precious relics from the Červený Kláštor monastery as well as from the whole region of the northern Spiš. It preserves also the lifetime work of the famous „flying“ monk Cyprian. Červený Kláštor spa was the first spa rebuilt after the war and today it is the most modern spa in Slovakia. 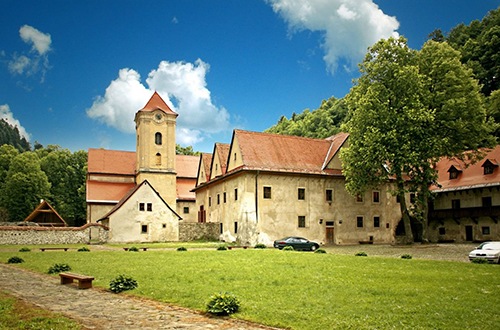 It is situated in the heart of breath taking Pieniny Mountains. There is unique curative-medical water flowing from the spring of Smerdžonka which thanks to its composition rich in minerals and hydrogen sulphide helps to heal skin diseases, locomotor system diseases, neurological diseases and digestive system diseases. The spa received the statute of climatic spa thanks to its exceptional climate and clean air. 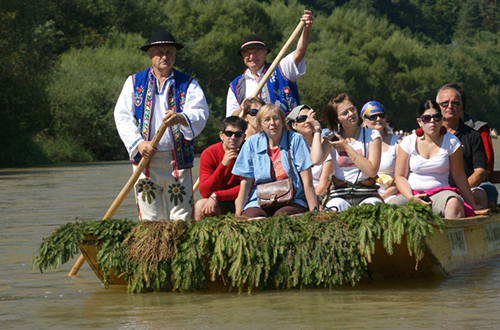 Fully guided rafting float tour along the river Dunajec canyon on the traditional wooden rafts is one of the best attractions of the Zamagurie region and the Pieniny Mountains. Experience the thrill and excitement of rafting and admire the beautiful natural scenery of the Pieniny Mountains. Rafting float tours on the traditional wooden rafts is wonderful, but even much more thrilling is rafting the river on the raft. 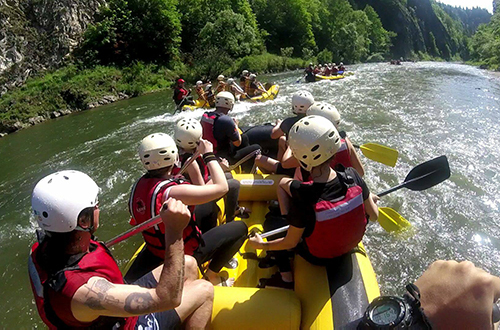 Take your family or your friends and enjoy adrenaline-pumping thrills of rafting in the heart of beautiful Pieniny Mountains where the only sound to be heard is the water roaring and one thing worth watching are the waves shimmering in the daylight. 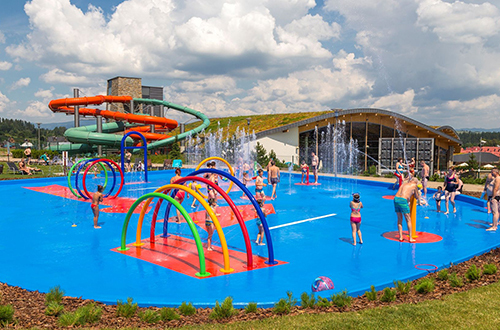 Vrbov thermal park is open year round and it offers swimming and relaxing in ten pools filled with natural geothermal water full of beneficial minerals. Water containing lots of minerals has beneficial effects on the locomotor system, airways and cardiovascular system. 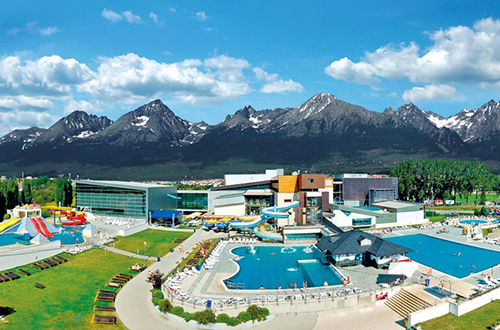 A thermal water park situated in a nearby Bialka offers various water attractions and family pools. The water park is divided into a fun zone featuring water attractions and spiral slides and relaxing zone featuring relaxing pools and massage jets as well as a large sauna zone. 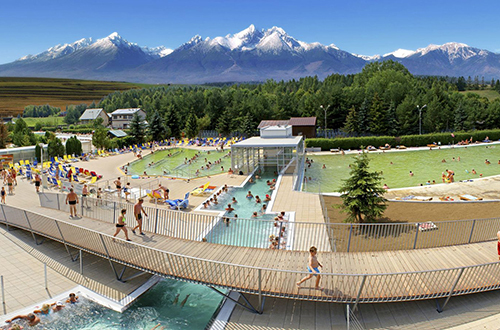 The village of Bukowina situated in the Polish Tatra Mountain region offers the visitors water fun, spiral slides, relaxing pools and saunas all year round. 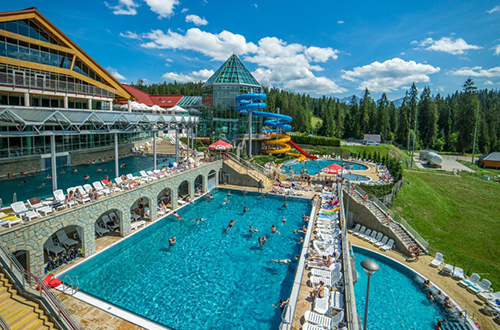 The town of Poprad situated right below the High Tatra Mountains offers the visitors a water park with 13 thermal and relaxing pools as well as 350 water attractions. You can relax in 2-storey wellness world Fire&Water SPA. A laser show is the perfect end to your visit. It takes place every evening in the Blue Sapphire pools. 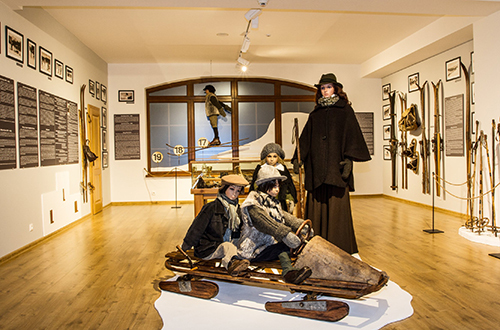 In the village of Tatranska Lomnica located in the High Tatras region there is a museum dedicated to the history, foundations and development of winter sports in the region of High Tatras from the very beginning until 1945. The most exciting attraction are 3.07 m long skies made in 1885, exhibitions of old bobsleighs, ski sticks, ski boots and ski workshop. In the town of Stary Smokovec there is a trick-art and optical illusion gallery offering a remarkable tour of Slovakia . 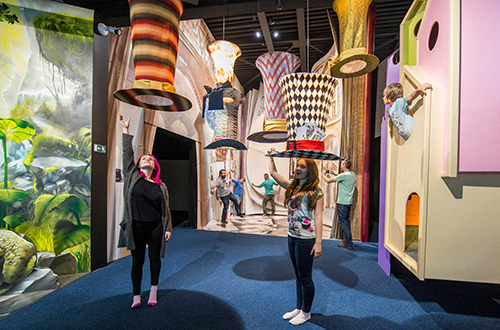 You will find up to 24 attractions within the space of 500 m2 including augmented reality, anti-gravity rooms, the most amazing mirror maze in the Central Europe and much more. Visit the historical royal town of Kežmarok with a pleasant atmosphere and beautiful monuments. Take a look at the Wooden Evangelical Articular Church (UNESCO), Evangelic Lutheran Lyceum with a historical school library, town castle with the Museum of historical vehicles and the oldest street in Kežmarok the Old market with its original charm while walking along the town. The walking tour of the historical town of Levoča with a remarkable renaissance square lined with the renaissance houses is a breath taking experience also for a hard-to-please visitor. The centre is dominated by the St. Jacob’s basilica [UNESCO] with the master Paul’s of Levoča altar and a renaissance town hall with arcades and allegoric characters of five virtues from 1615 and the cage of shame. Inside of the town hall there is a museum with the picture of legendary Levoča White lady and a piece of her dress. 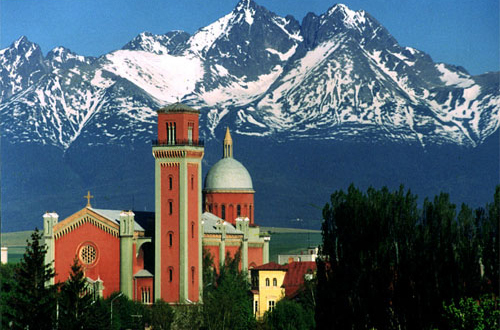 The Basilica of the visitation of the Blessed Virgin Mary on Marian hill is the venue of the famous Levoča pilgrimage [it takes place every year at the beginning of July] and it also offers a beautiful view of mythic Levoča. Každý návštevník je povinný oboznámiť sa pri vstupe na Chodník korunami stromov s týmto Návštevným poriadkom a dodržiavať všetky jeho ustanovenia. 1. Vstup na Chodník korunami stromov je možný len v čase prevádzkových hodín, a to s platným lístkom. 2. Deťom do 12 rokov je vstup na Chodník korunami stromov povolený len v sprievode dospelej osoby. 3. Dospelé osoby zodpovedajú za bezpečnosť detí. 4. Vstup na Chodník korunami stromov, vstup na zážitkové atrakcie a ich používanie je na vlastnú zodpovednosť návštevníkov. prípadne či sa v batožine nenachádzajú zvieratá. Návštevník je povinný prevádzkovateľovi na požiadanie svoju batožinu otvoriť a ukázať jej obsah. Návštevník, v batožine ktorého budú nájdené predmety, ktoré by mohli ohroziť bezpečnosť, zdravie alebo život ostatných návštevníkov, alebo návštevník, v batožine ktorého bude nájdené zviera, nebude na Chodník korunami stromov pustený, prípadne bude z Chodníka korunami stromov bez nároku na náhradu vstupného vykázaný. 6. Zážitkové atrakcie (adrenalínové zastávky) je možné z bezpečnostných dôvodov používať vždy len jednou osobou. 7. Návštevník je povinný každý úraz utrpený na Chodníku korunami stromov alebo v priestore prírodného detského parku bezodkladne po jeho vzniku nahlásiť prevádzkovateľovi Chodníka korunami stromov na pokladni objektu. Za úrazy vzniknuté v dôsledku zanedbania povinnej opatrnosti návštevníka či zanedbaním dohľadu nad osobami, nad ktorými je návštevník povinný vykonávať dohľad, prevádzkovateľ Chodníka korunami stromov nezodpovedá. 8. Za veci odložené v priestoroch Chodníka korunami stromov vrátane parkovísk a gastro prevádzok prevádzkovateľ nezodpovedá, pretože sa nejedná o priestory k tomu určené. 9. Chodník korunami stromov je opatrený požiarnymi únikmi, ktoré sú prevádzkovateľom na jednotlivých miestach Chodníka korunami stromov vyznačené značkou. Tieto požiarne úniky sú návštevníci povinní využiť výlučne v prípade vzniku požiaru či na príkaz prevádzkovateľa. Pri použití požiarnych únikov v prípade požiaru sú návštevníci povinní riadiť sa pokynmi prevádzkovateľa a hasičov. 11. Pri protiprávnom konaní, v prípade porušenia predpisov ako aj tohto Návštevného poriadku, je zamestnanec prevádzkovateľa oprávnený návštevníka z Chodníka korunami stromov vykázať bez nároku na vrátenie vstupného, prípadne návštevníka bez nároku na vrátenie vstupného na Chodník korunami stromov nepustiť. Prevádzkovateľ je oprávnený prijať ďalšie potrebné opatrenia. 12. V prípade náhlej zmeny počasia (búrka, víchrica a pod.) sú návštevníci povinní riadiť sa pokynmi zamestnancov prevádzkovateľa a Chodník korunami stromov okamžite opustiť. 13. Návštevníci berú na vedomie, že na Chodníku korunami stromov môžu byť pri príležitosti rôznych akcií prevádzkovateľom zaznamenávané obrazové a zvukové záznamy a dávajú k tomu súhlas. Návštevníci tak súhlasia so zverejňovaním fotografií zhotovených na Chodníku korunami stromov, na ktorých sú zobrazení, a to na webových stránkach www.chodnikkorunamistromov.sk a www.facebook.com/chodnikkorunamistromov, prípadne s použitím a šírením týchto fotografií pre reklamné a propagačné účely prevádzkovateľa aj iným spôsobom. Svoj nesúhlas so zachytením podoby či s prípadným použitím a šírením takto zachytenej podoby sú návštevníci povinní jasne vyjadriť a podať ho prevádzkovateľovi v písomnej forme pred vstupom na Chodník korunami stromov. 14. Prevádzkovateľ upozorňuje návštevníkov Chodníka korunami stromov, že priestor pokladní je prevádzkovateľom v dobe prevádzky Chodníka korunami stromov monitorovaný kamerovým systémom a je zhotovovaný obrazový záznam. Zhotovený obrazový záznam bude použitý v prípade, že v tomto priestore dôjde k strate, krádeži či poškodeniu majetku návštevníkov alebo prevádzkovateľa, alebo k inej obdobnej udalosti. V takomto prípade bude zhotovený obrazový záznam predaný príslušným štátnym orgánom, najmä PZ SR.
15. Akékoľvek nakladanie s osobnými údajmi sa spracováva v súlade s nariadením európskeho parlamentu a rady (EÚ) z 27. apríla 2016 o ochrane fyzických osôb pri spracúvaní osobných údajov a o voľnom pohybe takýchto údajov – GDPR a zákonom č. 18/2018 Z. z. o ochrane osobných údajov. Bližšie informácie o právach návštevníkov podľa uvedeného nariadenia a zákona je možné nájsť na internetových stránkach https://dataprotection.gov.sk/uoou/sites/default/files/nariadenie_2016_679_text_sk.pdf a https://dataprotection.gov.sk/uoou/sk/content/zakon-c-182018-z-z-o-ochrane-osobnychudajov-o-zmene-doplneni-niektorych-zakonov-publikovany. • Jazda na tobogane je určená pre návštevníkov od 120 cm, a to len na špeciálnej podložke a vždy po jednom. • V prípade nepriaznivých meteorologických podmienok je tobogan uzavretý. Európske spotrebiteľské centrum v SR Mierová 19, 827 15 Bratislava tel. : 02/48542019, e-mail: info@esc-sr.sk, web: www.mhsr.sk. Spotrebiteľ môže využiť platformu pre riešenie spotrebiteľských sporov online, ktorá je zriadená Európskou komisiou na adrese http://ec.europa.eu/consumers/odr/. Návštevný poriadok nadobudol platnosť od 14.12.2018. Majiteľ zvieraťa, ktorý chce na úschovu zvieraťa využiť voliéru, je povinný oboznámiť sa s týmto úschovným poriadkom zvierat a dodržiavať ho. Voliéry určené pre úschovu zvierat sú vo vlastníctve spoločnosti Chodník korunami stromov s.r.o., so sídlom Hviezdoslavovo námestie 16, 811 02 Bratislava, IČO: 50 862 839 (ďalej len "Chodník"). Voliéry určené pre úschovu zvierat sú vyrobené z kovu a masívneho dreva s rozmermi: Š 100 cm / V 100 cm / H 200 cm. Predná otváracia strana je tvorená kovovou bránkou. Služba úschovy zvierat je poskytovaná Chodníkom zadarmo, použitie týchto voliér je úplne dobrovoľné. Je však nutné upozorniť na to, že na atrakciu nesmie podľa Prevádzkového poriadku Chodníka žiadne zviera. Koterce sú určené výhradne pre úschovu zvierat návštevníkov atrakcie Chodníka korunami stromov a to po dobu jej návštevy. Zvieratá môžu ich majitelia uložiť do koterca iba za predpokladu, že sú v dobrom zdravotnom stave, sú čisté a pokojné. Majiteľ zvieraťa plne zodpovedá za zdravotný stav a správanie svojho zvieraťa a je povinný uhradiť škodu, ktorá by Chodníku vznikla z dôvodu jeho zodpovednosti za škodu, ak by táto škoda bola spôsobená v príčinnej súvislosti so zlým zdravotným stavom odkladaného zvieraťa či jeho správaním. Majiteľ zvieraťa musí s ohľadom na vlastnosti zvieraťa zhodnotiť, či je pre neho odloženie do koterca vhodné a či je možné vzhľadom k povahe zvieraťa túto službu využiť. Majiteľ zvieraťa je povinný zabezpečiť, aby zviera odložené do koterca nespôsobilo žiadne škody na majetku a zdraví tretích osôb a zvierat ostatných návštevníkov. Majiteľ zvieraťa je povinný zaistiť svojmu zvieraťu dostatočný príjem vody po celú dobu jeho úschovy v koterci. V každom koterci je za tým účelom umiestnená miska na vodu. Pre jej naplnenie sú v blízkosti kotercov pripravené barely s čistou vodou, ktorá je pravidelne menená a doplňovaná. Majiteľ zvieraťa je povinný zabezpečiť, aby do koterca bolo zviera odkladané nasýtené a len po dobu nevyhnutne nutnú k návšteve atrakcie Chodníka korunami stromov, najmä tiež s prihliadnutím na to, aká doba je pre zviera vhodná, s ohľadom na aktuálne počasie, stav a povahu zvieraťa. Chodník neposkytuje zvieratám návštevníkov krmivo zdarma. Krmivo je možné zakúpiť v pokladni. Majiteľ zvieraťa je povinný po ukončení návštevy atrakcie Chodníka korunami stromov zviera prevziať z úschovného koterca. V prípade, že koterec bude po zvierati znečistený, upratať ho a vrátiť na pokladni Chodníka poskytnutý kľúčik od koterca. V prípade straty kľúča od koterca je na pokladni Chodníka uložený náhradný kľúčik. Na prispôsobenie obsahu a reklám, poskytovanie funkcií sociálnych médií a analýzu návštevnosti používame súbory cookie. Informácie o tom, ako používate naše webové stránky, poskytujeme aj našim partnerom v oblasti sociálnych médií, inzercie a analýzy. Ak súhlasíte s používaním súborov cookie, kliknite na tlačidlo „Súhlasím“. Pre viac informácií si prečítajte naše Prehlásenie o súboroch cookie. Zistiť viac.